Natural gas' fundamentals are improving and Chesapeake along with other large producers are ready to increase their profits. U.S. natural gas is seeing lower inventories, higher prices, and slow production growth; these are the ingredients for a strong turnaround. This is great news for Chesapeake Energy (NYSE:CHK) as its first quarter 2014 production on a barrel of oil equivalent basis was 71% natural gas. Chesapeake's push into oil and wet gas production helps diversify its income, but the improving natural gas market will be a major boost to its bottom line. 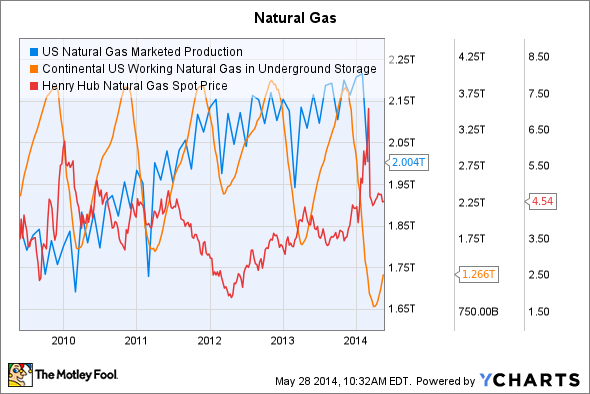 The amount of natural gas in working storage plummeted to levels far below those seen in 2013 or 2012. This is great news for the industry as it shows that consumption and production are finally falling in line. The fall in inventories occurred even though the November 2013 to March 2014 winter saw less natural gas consumption than the same 2012-2013 period. While the temporary spike in Henry Hub prices above $7.00 per mmBtu is over, natural gas continues its slow upward climb. Stronger prices will help Chesapeake. The company is not going to abandon natural gas anytime soon. It estimates that after asset sales, its 2014 adjusted natural gas production will grow 4% to 6% year over year. With 64% of its 2014 natural gas production hedged, Chesapeake will benefit from increased natural gas prices without being fully exposed to market volatility. ExxonMobil (NYSE:XOM) is big name that is seeing benefits from higher natural gas prices. From the first quarter of 2013 to the first quarter of 2014, its average realized natural gas price grew from $3.21 per mcf to $4.78 per mcf, helping to boost its first quarter 2014 upstream earnings by $410 million year over year. $410 million works out to be a 5.8% growth in its upstream earnings. The company has a good handle on future North American natural gas developments. It is already active in Canada's Montney and Duvernay shales. In the U.S., it is active in gas-rich shales throughout Texas, Louisiana, the Northeast, and elsewhere. In the fourth quarter of 2013, Anadarko Petroleum (NYSE:APC) and Devon Energy (NYSE:DVN) were the third and fourth largest producers of natural gas in the U.S. after ExxonMobil and Chesapeake. Like Chesapeake, Anadarko is trying to bring down its 0.71 total debt-to-equity ratio by focusing on higher-margin production with immediate payoffs. U.S. shale plays with significant natural gas production are a big part of Anadarko's new focus. In the first quarter of 2014, liquids accounted for 35.1% of its U.S. onshore sales volumes, giving improving natural gas pricing a big opportunity to boost its bottom line. Anadarko is also seeing good non-gas numbers in the Delaware Basin with 85% or more of production coming from liquids. Devon Energy is heavily exposed to natural gas. It accounted for 33% of Devon's first quarter 2014 production, but the company expects that in the fourth quarter of 2014, natural gas will increase to 43% of production. With 75% of its second to fourth quarter 2014 natural gas production already hedged, improving natural gas prices will help Devon to a limited degree in 2014. The upside is that Devon has more flexibility than Anadarko or Chesapeake. Its total debt-to-equity ratio is only 0.59. Demand for U.S. natural gas is growing and inventories are falling. Compared to world standards, U.S. natural gas is still very cheap; this signals that the market has room to run. Strong natural gas prices will help Chesapeake and Anadarko create more stable businesses with lower debt loads. ExxonMobil, on the other hand, does not have big debt issues and its status as the largest U.S. natural gas producer in the fourth quarter of 2013 means that it is ready to profit.